With the legendary Swedish director Ingmar Bergman now dead, it seems like an appropriate time to revisit what many claim to be his finest film. 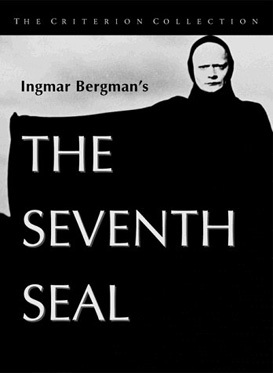 Set in the Middle Ages, The Seventh Seal follows the final journey of a Knight (Max von Sydow) who after returning from a ten year crusade finds himself washed up on a beach with his trusty Squire (Gunnar Bjornstrand). God-beams burst through the clouds and strike Antonius Block’s face as he prays for his deliverance. But even as he does, Death (Bengt Ekerot) invites him to play a game of chess. As long as he resists defeat he will live. And as long as he lives, he aims to seek knowledge. It’s a sombre black and white dance of death that will eventually claim Block but along the way he will have many important encounters; he meets an angelic young woman about to be burned at the stake for being in cahoots with the devil and bringing about the plague; he finds bliss in the company of a travelling troupe of actors who feed him fresh milk and wild strawberries on a sunlit hillside. But with Death stalking him all the way, moments like this are merely stolen. Bergman was the son of a priest and he seriously explores the idea of religion throughout this film. There’s a key scene where the troubadours are performing in a town square when their light-hearted antics are interrupted by a procession of self -flagellators dragging an enormous crucifix. The juxtaposition of joy and pain is vivid. So too is the love that surrounds the actors and the hate that envelops many of the townsfolk they bump in to. In the end, of course, it’s love that fuels the life force. And a little bit of self sacrifice too.